In honor of the little humans everywhere going back to school, we pulled out our pencil and school bus toys for this week's Sunday Selfies. That's right, the Beatles Kittens are STILL with us. They had their second FIV tests on Thursday. Two of them passed (they are FIV negative). We are still waiting on the results for the other two. We hope they pass too so that these guys can graduate to their forever families. No, we REALLY can't wait for them to graduate!!!! They are like rowdy teenagers. They no longer pay attention in class. I don't know what we are going to do with them! Please purr that they all pass their tests soon. 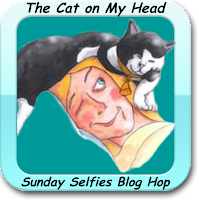 We are joining our friends at The Cat on My Head for their weekly Sunday Selfie Blog Hop. Please hop on over to see the other entries. We think Georg is super cute! He pulls sweet faces!!! Aww you guys are almost there, I hope very soon the title will be that of Phil Collins album "Hello, I must be going!" Wishing the Fab Four the very best on the tests. They are such cuties, I know they will all be adopted quickly. We love seeing that wonderful bunch of cuteness!!! How are your teachers supposed to concentrate with all that adorableness??? OMC, they're adorable. But we understand about teenagers being rowdy and stuff. Paws crossed! Great photos! We hope they pass their tests soon so they can get nice forever homes. Such cuties! I hope they ALL pass their tests and are on their way to a wonderful FOREVER!!! Cute. They're ready for school. Hope all these babies pass their tests and can graduate ! We hope you all get great test results!